Before we ever start, you should know that there’s hardly anything that people hate more, than banner ads. Web users hate banner ads because they interrupt they’re browsing journey. Designers also hate banner ads, because they can’t get really creative and have to work on a small piece of pixels. Even marketers don’t like them, as they believe banner ads aren’t effective enough. However, users spend more time on the web by day and online banner ads seem to be one of the most practical ways to reach out to these people. Moreover, the display advertising industry is balanced well enough to develop and even surpass search and spend. And banner ads can be anything, but annoying. You just need to know how to appeal to your target audience and create a good experience for it. This is where our guide comes into play. We have outlined several principal concepts in the following 8 chapters that will help you create a wonderful banner ad, whether you’re a small business owner, designer, or marketer. Alright, to kick off, let’s think about what makes a banner ad good. Could it be the design? Or maybe it’s the offer, such as “50% OFF JUST TODAY!”? Or could it be something as odd as targeting? It’s not so simple to answer this question, since a banner ad is good, when it combines a variety of factors. To put it simple, a well-rounded banner ad delivers the right message, in the right place, at the right time. However, you can’t do it properly, unless you actually know the individual that you’re designing your ad for. This is our point in this chapter: you have to know your brand’s target audience. Why Target Audience Is So Important? The thing is that a good display ad campaign consists of multiple interaction points between the advertised product/service and the user. This includes every component of your campaign: landing page, banner ads, and all the touch points between the customer and the product. In case you’re willing to achieve essential results with your banner ads, you have to provide a proper and engaging experience to your audience at each step of their journey. Starting with your banner ad and all the way to the landing page, every single interaction has to provide your target audience with relevant and practical information in order to engage them. And if you don’t know who you are doing this for, it’s almost impossible to generate a proper user experience. At this moment, you could be thinking that even though this all sounds rather nice, you don’t have the time and/or resources to do it. And before you continue this thought of yours, think about this first: would you notice anything not relevant for you? If your answer is ‘no,’ then why do you think your audience will act differently? Well, there’s good news for you: there’s no need to conduct extensive research of the market in order to determine your target audience and the things that get their attention. Who is using your service or product? What is their usual day like? What are some of their problems? And if you have the budget and time, you could even conduct an extensive study and obtain more information regarding your target audience. However, you can still use the questions above and discover some significant data to make a better connection with your audience. When you answer these questions, you will get one step closer to creating a banner ad that will draw you target audience’s attention. So, make sure to spend a few minutes and answer them. Once you’re done, let’s move onto the next chapter – technical requirements of a banner ad. Prior to getting down to banner creation, there are a few things you should always remember. The things we’re going to discuss in this chapter are technical considerations that will help to approve your banner add. Banner ad size is really important for an ad campaign. If you end up with an unpopular size, you will get lower amount of impressions, thus reducing the audience you could potentially engage with it. On the other hand, in case you choose one of the popular sizes, the chances of your banner ad to get noticed by the right users increase exponentially. Alright, what is a good size for a banner ad? Majority of sites that run web ads – also referred to as publishers – accept banners that are 160x600, 300x250, and 78x90 pixels. The Interactive Advertising Bureau (IAB) standard ad package as well includes banner ads, but their size isn’t really popular among publishers. In general, web banner ads shouldn’t exceed the size of 150KB. Nevertheless, various ad networks and publishers could differ in requirements. Lest you are publishing your ads via Google Display Network, make certain to check with the platform or publisher you want to publish with or through with the maximum allowed size. However, you should note that SWF (Flash) banners will not be supported by browsers anymore and will be replaced with HTML5. There are several particular requirements for animated banners and banners with multiple slides. First of all, the animation in your banner shouldn’t exceed 30 seconds. You can loop the animation, but it has to stop after half a minute. GIF banners should not exceed 5 frames per second, whereas flash ads shouldn’t exceed 20 frames per second and must have the clickTAG variable. GIF banners should not exceed 5 frames per second, whereas flash ads shouldn’t exceed 20 frames per second and must have the clickTAG variable. Include only professional, clean images into your banners. Your banner ad could get disapproved, if it features images that are hard to recognize or blurry. Your banner ad has to be easily distinguishable from the rest of the page it’s placed on. The ad has to look, like an advertisement. The advertiser has to be easily recognizable and identifiable (consider using logo or branding). Plus, you can’t replicate system or site warning, error messages, or dialogue boxes. Animated banner ads may include animations or features, if they may be reproduced on the landing page. Lest your ad publisher or network approves, the following categories are not allowed in display online advertising: alcohol, adult services and products, illegal drugs, tobacco and tobacco-related products, counterfeit goods, fake documents, gambling (both offline and online),”anti” or violent concepts. Also note that there is a particular set of requirements for health and health related products. There are four principles in graphic design followed by every good design. Of course, this may vary, as some designers go up to eight design principles to follow. However, the following four principles – also referred to as CRAP design principles – are the foundation of any solid design. It becomes rather hard to notice the details, when all of your design’s items, including color, shape, and size, are practically the same. This is exactly, when contrast changes the perspective. This principle implies that the reader can easily tell elements from each other and discern your design’s significant information. Contrast is what makes your banner stand out and attract visual attention. There are many ways of creating contrast: color, font weight, placement, size, spacing, or typefaces, for instance. The greater the difference between your banner’s elements, the better the principle of contrast is applied. As a result, contrast helps getting more visual attention from your target audience. Contrast makes your banner attract visual attention. Let’s take an example with text. Pretend that you chose 10 points – 11 points will not be really different from the original. But, if you choose greater differences, such as 10 and 16 points, you will apply this principle properly. It is the same with colors – don’t combine colors that look similar. Go for greater difference, like blue and yellow. Whereas contrast makes your banner ad’s elements more prominent for the eye, repetition is all about bringing structure and organization into the design. The repetition principle implies that an aspect of your design has to be repeated throughout all of your work. This helps make the design consistent through the use of elements that connect its different parts. Repetition may show through the use of the same size, color, contrast, font, or the same graphic element (bullet, logo, clip art, etc.). Alignment is about making difference between an easily understandable design and a design that leaves you guessing about its message. Alignment principle implies that nothing should be placed arbitrary or randomly in your design. Buttons, images, type, font – everything on your banner ad has to be visually connected between each other. When ad’s elements are placed in a random manner, the banner looks sloppy and its design starts to look quite unprofessional. Moreover, your users will get confused and, thus, will need to spend more time for the understanding of your design. And this, in turn, will decrease the probability of getting clicks from web users. Appropriate alignment increases the sensation of a stronger, consistent ad. Your design gets stronger and balanced, gaining a trustworthy and clean look, when you apply alignment right. Make certain you apply alignment in your banner ad design consistently. In case you have aligned some of ad’s elements on the left, the rest of its elements should be aligned on the left, as well. Users can hardly focus and understand on your message, when the ad’s mutually complementing elements are scattered all over the place. Use proximity to group related things together and to organize your design. The proximity principle implies that elements related to each other or similar should be placed in groups correspondingly. This helps forming visual consistency instead of several separate element groups. This also ensures that the ad’s elements and information are organized properly and, thus, are readable and understandable. are the basis for any solid design. a. Make sure your design isn’t congested. Although the four principles described above provide you the idea of what you should focus on, when working on a design, they don’t mention things you should stay away from. That said, avoid adding too many elements or too much text to your ad, as it will make your design look unprofessional and crammed. In case you think you need all the information in your design, it’s better to split it across several slides. Just remember to not stuff it all in one small piece of design that is your banner ad. b. In case you are designing banners with several slides or animated banners, make sure they are interconnected. The slides should be visually and semantically consistent. Here’s a fact for you to consider: the human brain handles images 60,000 times faster, than it does text. This is actually one of the reasons why images are more effective in creating and delivering a stronger message through banner ads. Properly selected and placed visuals may help you deliver your message to the audience much more effectively, than just text. Question is: how to choose the best visuals for your banner ads? This one is obvious. Using blurry and low-quality visuals will simply make your ad look unprofessional. And what you don’t want your ad to be is uninspiring and inconsistent. Users will not have a sense of urgency to click on an ad like this, even though your message could be really alluring. You can easily avoid this by using clear, sharp, and professional images in your banner designs. Even if you can’t afford hiring a professional photographer, you can still make use of stock photography websites with a lot of relatable photos that you may use in your ads. The main purpose of images in your ad is to support and intensify your message. Once you have set up your value proposition or clearly determined your offer’s benefits, you must look for a visual that will support your message and as well assist you in communicating them to your audience more effectively. For example, if you are selling printing services, include images of how good the quality of your work is. In case, you have a promotion or discount, you may consider using a clock to emphasize on the idea of your limited time offer. Nevertheless, make certain that you have a solid value proposition developed first and only then look for the images for your banner ad. And do it in this order, because otherwise the process won’t be as effective. People tend to respond to those they like rather than otherwise and as well tend to like those similar to them in some way. It’s important to remember this fact when choosing visuals for your banner ad designs. Your audience has to be your main focus. Think of what your audience is like. Do your best to include images of people that are similar to them in your ad designs to increase their persuasiveness. It’s also essential to remember about your brand and the personality that you want to deliver. Only choose images that work both with your branding and messaging. Remember that a brand builds over time. Thus, select images consistent with your vision in order to build brand awareness among your target audience. This was already mentioned in the chapter about color and contrast. It applies to images, too. It’s quite difficult to read images with low contrast. Plus, choose colors that precisely match and emphasize on your ad’s context. Let’s say you are running Facebook ads. It’s better to stay away from blue-colored images and instead use yellow. This way, your chances of getting noticed seriously increase. We always respond to the things that affect us in some way. You are able to heighten your chances of getting noticed by your target audience and settling a solid connection with them using images that provoke strong emotions. Usually, positive emotions get better feedback. So, if you can, go for images of happy people in order to set a positive tone of your offer. However, you may also consider using shock and fear to get users’ attention. This particularly works in conveying messages in campaigns focused on social responsibility. Our brain is set to notice the things it’s searching for, things it needs. If, for example, we expect to see white and gold items on the Easter day, we are going to first notice images featuring these colors. Themed or seasonal images set the base and inform users about what they may expect. Moreover, it’s a sign that you always keep up to date with trends, seasons, etc. Note that there are no steadfast rules, when it comes to images. It doesn’t mean that if something works for one company will work for another. You have to find out what works best for you. It’s all about trial and error. Color is basically one of the forms of non-verbal communication. It’s able to improve reading, learning, and comprehension. In addition, since it is a visual component, the brain perceives and understands it much quicker than text. Now, how can you select the best colors for your web banner ad? First of all, you are free to ignore all the general information you’ve ever heard or read or seen about color. Don’t even start reading some random articles suggesting that yellow is an expression of joy and red means anger – this is just a waste of time. There’s no scientific proof that would justify such associations. In reality, color depends on personal experience too much. So, it’s impossible to universally translate particular colors into particulars feelings or moods. Culture, language, personal characteristics – all of these factors influence one’s color perception. This, in turn, makes it difficult to forecast, how a large audience is going to react to one color or the other. Did you know that basics of Colour Psychology can help you achieve great goals in advertising? There are also no bad or good colors, because colors start to acquire particular meanings and importance only in context. That said, there is no substantial proof to state that, for example, red works better than green. But, there are certain circumstances, in which red does work better than green. In order to know how to use colors properly, it’s necessary to know the tools you can use. a. Blue, red, and yellow are primary colors in subtractive color mode. You can get any other colors by combining these three. b. You may obtain secondary colors by combining any of the two primary ones: green (blue and yellow), orange (red and yellow), and purple (blue and red). c. Tertiary colors make passage in the color circle between the primary colors and the secondary colors. They are acquired by combining equal portions of a primary color and a secondary color. a. Tints – obtained by combining pure colors with white, thus increasing their lightness. b. Shades – obtained by combining pure colors with black, thus increasing their darkness. In addition, colors are divided into two principal groups: cold colors, including blue, green and purple, and warm colors, including orange, red, and yellow. a. Monochromatic – these color schemes employ a base color with tints and shades for variations and can be used for generating an organized and clean look. b. Complimentary – these color schemes are made by mixing colors located on the opposite sides of the wheel, for example orange and blue. These schemes have the highest contrast. c. Triad – these color schemes employs three colors that are located at an equal space from each other around the wheel. These combinations create a good balance and diversity. If you use too many colors, your banner ad may become confusing and difficult to comprehend. This is why experts recommend choosing a simple color palette with 2-4 colors maximum. Moreover, a study conducted by the University of Toronto displayed that people mostly prefer combinations of 2 and 3 colors. a. Select the colors proper for the context you are about to build. b. Select colors that make enough contrast with each other. As it was mentioned previously, color is one of the communication forms, and it can be used to create a more compelling and convincing. Take your time to ponder on the message you want to deliver or on the emotions, values, or personality you want your brand to be associated with. When you make up your mind on these, choose proper colors to emphasize on them. In case you want to emphasize on positivity, use warm and bright colors. And, if you want to state your boldness, use pure shades, such as yellow or red. Don’t forget that context is very important and there’s a sensed relevance for colors in certain situations. Attempting to work around this may rebound in the way your brand is perceived. So, you might consider using darker colors for positive situations to stand out from the crowd of competitors. Nevertheless, due to the people’s sensed associations for colors, you may find it hard to settle a clear image of your brand the way you want it. Also, don’t neglect the cultural meaning of color. For example, take color red, which is a happy color in the majority of Western cultures, whereas it’s a mourning color in Japan. Think about your target audience, when choosing colors. Although you still will need to conduct your own study on associating colors, you should remember that colors are age and gender specific. 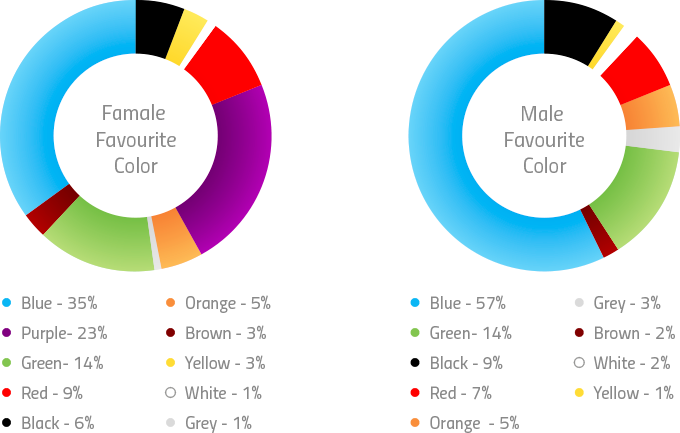 Study has displayed that men and women differ in their color preferences. Both genders have a particular preference in blur, but men seem to love this color even more. In the same time, women prefer purple more. Orange and brown are considered the least preferred colors in general. And there’s a little difference in this, as well. Women don’t like brown, grey, and orange the most. In the same time, among men, brown, orange and purple are the least popular colors. Both genders dislike yellow pretty much the same. You should take age into account as well as gender. Although blue is considered a constantly preferred color in general, favor for other colors varies depending on age. It is considered that with maturity people develop greater preferences toward shorter wavelength hues, such as green, blue, and purple, comparing to longer wavelength hues, such as orange, red, and yellow. Studies have revealed that color preferences are affected by cultural and social factors. Different age groups also have their own least preferred color. Nevertheless, orange, brown and purple top the list here as well. People’s preference for yellow gets lower as they get older, too. And here we are again, back to talking about contrast. It is one of the crucial principles in design. You can use it to emphasize on significant information, as well as help users distinguish elements of your designs. Plus, colors will not be truly effective without a strong enough contrast. This is why it’s better to select colors with a considerable degree of contrast between them. This makes it simpler to recognize the design’s elements. For instance, your ad’s background is blue and if you place a dark blue button on it, it’s unlikely that users will notice it. Choose a color that will contrast with the background, in this case orange or yellow will do perfectly. Moreover, make notice of how strong colors contrast with each other. Low color contrast could look wonderful, but the text placed on it is difficult to read, and users will need more time and effort to distinguish the banner’s elements. In the same time, text is easily readable with a high color contrast. However, make sure to not overdo it, since you don’t want to make it hard on the users’ eyes. Your ad copy has to answer the following questions: “Why should I pay for this?” or “Why do I need this product/service?” And it should do this in a persuasive, compelling manner. Note that often people don’t buy stuff just because they need this or that. They purchase things and pay for services, because of the way they will make them feel or look. This is the reason your banner ad copy has to instantly communicate the value of the products you advertise. Although there are many formulas for generating a compelling copy for ads, creating a strong value proposition will make your ad much more effective. 1. What’s a Value Proposition? Simply put, the value proposition provides a brief and clear explanation of how your product or service addresses customer needs, how it improves situations, and how it solves issues. It explains the value that will be delivered and one of the main reasons why a customer should buy from you. a. It has to be relevant for your clients. It’s pointless to stand out just for the sake of standing out. You have to stand out in a way your clients actually care about. b. It has to explain how particular advantages are delivered and how the service/product differs from other similar offers and how it is better, than them. c. It has to be clear and simple to comprehend. Your value proposition has to talk the client’s language, so they can see that it is relevant to their needs. Alright, so how do you create a solid value proposition? First of all, you have to know your product/service as well as its competition. Secondly, you must know your audience and how they perceive the problem your product or service is solving. To get a good value proposition, connect the dots. You may also consider using the value proposition templates we included in this chapter. Simon Sinek is a leadership specialist. He teaches at Columbia University and is the author of “Start with why.” He states that people don’t buy your products or services, but rather why you do it. The value proposition suggested by him helps organizations connect the dots between the what and the why. This template is the easiest in the list. It’s simple to build and, thus, simple to comprehend. Template: “We help X do Y doing Z”. Sample: We help designers create web banner ads at their finest. Vlaskovits and Cooper are using a Customer-Problem-Solution presentation in their Cheat Guide to Customer Development. Customer: _______________________ (who your client is). Problem: _______________________ (what issue you’re solving for them). Solution: _______________________ (what is your solution for the issue). Geoff Moore has become famous after releasing his book “Crossing the Chasm.” The value proposition framework he offers has become really helpful for many organizations in communicating their value propositions clearly to their audiences. Superlative (“why select this product/service”). Label (“what is this product/service”). Qualifiers (“who should choose this product/service”). Sample: The simplest operating system for laptop computers. Clay Christensen proposes an approach that derives from the conviction that the value proposition starts with comprehending the higher purpose that products/services fulfill for clients. He states that people don’t purchase things, but rather “hire” them to take care of their issues. Include numbers and percentages in your value proposition. Numbers make the benefit seem even more tangible and quantifiable, thus making it more appealing for your customers. Let’s be honest, an ad without a call to action (CTA) is a flop. Your audience will see the ad, but most likely will not take action, unless you encourage them to. This is why CTA is crucial for any solid web banner ad. It defines if the prospect makes their next move into the conversion funnel or if he passes by. If you want your audience to react to your offers, you have to particularly ask them to take action. CTAs and your goals are directly connected. The may be about requesting data, downloading, making a reservation, buying, hiring, etc. This is basically what your web banner ad should ask your audience to do. We’ve already talked about how the value proposition answers the “What’s in it for me?” question. By answering this question, you can build up a great offer for your audience. However, the value proposition does not say what they should do next to obtain the described advantages. And this is, where CTA comes into play. CTAs make the connection between the ad and the conversion rate. They show your prospects where they should go, leading them down the conversion funnel with the precise action they have to take. First of all, don’t fall for things, like “Color green increases conversion rates.” And ignore any other universal statements about colors, like the one that color red is associated with anger, etc. All of those are just tricks that will not add any essential value for your audience. A good CTA addresses your target audience’s needs, while supplying meaningful and significant information. Your prospects should get a clear idea of what they are going to get after clicking it. Call to action also perfectly blends in with the rest of your ad’s messaging and the landing page. Begin with outlining the needed action. What do you want your audience to do? Then, outline a solid value proposition user benefits or user benefits. This way, you will be able to draw audience’s attention, while giving them enough reason to take the next step and click the ad. It also helps prospects to make their mind to either move on to the next step or pass by. Be specific. Lastly, consider the three principal elements that determine the CTA: text, design, and positioning. All of these are synced in every solid call to action. The CTA text is crucial, since it gives your audience an idea about what is going to happen after they click the button. Generally, it has to precisely describe what your audience will get after clicking. It also has to align with the advantages promised previously. Below are several tips for writing an effective CTA text. If your audience needs a moment to think about your offer, you’ve lost your prospects. The simpler the language, the higher the chances of getting a click. Your CTA text has to make your visitors want to take action. If you want your CTA to be effective, it has to fit in naturally with the rest of your ad’s messaging. If it is too far off from the value proposition, it will not prompt your users to take action. Make sure your message and value proposition are set in the same direction. If you want people to click your ad, your call to action has to stand out and look, like a button, so they want to click it. Button-like shapes will help your audience acknowledge that they have to click in order to progress. Once again, there are no standard, universal rules, like which color will get more clicks on your ad. You have to combine the foreground and background colors properly. Select a color that creates good contrast and emphasizes on your CTA, comparing to the rest of your banner. Your design’s important elements have to be underlined respectively. Make certain that the CTA doesn’t get lost among other elements. It has to be noticed, but has to organically assimilate with your design’s other elements. Use a simply readable font size and typeface on your CTA button. If the call to action text is too small or difficult to read, you may lose the audience. You have to ensure you don’t have any distracting elements close to your CTA button. Along with this, note that a clean and order banner ad design gains more trust from the audience. Once again, there are no specific rules here. So, test, test, and test. Try avoiding the standard “add to cart,” “click here,” and “download” phrases. They are used too much and, thus, can be ignored by the audiences. In order to get more attention, consider adding a personal touch to your CTA. Consider including personal pronouns, like “me,” “you,” or “yours” (as in “sign me up now”) to add some sort of personal feel to your ad. Never promise the things you can’t provide. Although it may seem, like an obvious thing, it frequently happens in advertising. The result is something you never want – lose your audience’s trust. Moreover, an unsatisfied prospect is 13 times more probable to complain about you and spread their frustration, than a satisfied customer is to spread the good news. Remember this, when you are tempted to promise the things you can’t deliver. In case your landing page significantly differs from the things advertised in your banner ad in terms of content, design, and visuals, don’t expect good conversion rates. Never abuse urgency. Audiences get tired of this rather quickly. So, use it only when it’s true about your product/service. Ask yourself, would you still want to buy a good from a shop that offers a 40% discount only for 3 days and has it for two weeks? There is a book called ”The psychology of influence and persuasion”, written by Robert Cialdini. The book went on to become one of the most popular manuals on the art of persuasion. The 6 principles listed in the book have proved to be effective over time. Here are a few things any good designer has to know in order to create a more persuasive copy, when designing web banner ads. This principle implies that people conduce to observing and following other people’s actions. As humans, we tend to trust things approved by many people. The more people are using something, the more probably we will start using that something, as well. When people don’t know what option to follow, they look around to see what others are doing. It all is connected to the psychological need for acceptance. We need acknowledgement for who we are, as individuals. We love being approved based on what other people are doing. User reviews, ratings, and testimonials. People don’t like uncertainty and, thus, will look for any means to overcome it. One of the most common ways of doing this is looking to people that seem, like they know what they’re doing. People are more likely to listen to the recommendations and advice of people that are holding some kind of authority. This principle shows that authority figures are very influential and persuasive. Sophisticated design, elegant fonts, business titles – anything that creates the impression of authority can make your design more convincing. The more limited something is, the more valuable it is considered. We are attracted to limited and exclusive items. The root assumption is that items that are difficult to obtain are better, comparing to the things easily obtainable. People unconsciously make the connection between availability and quality and place a higher price on items that are in limited supply. You may use scarcity by offering a limited amount of items or limited-time availability of the item, service, or special offer. Nevertheless, you have to be cautious and not overdo it. No “5-day exclusive” offers lasting for six weeks. Being in debt makes people feel psychologically uncomfortable. This is the reason why the reciprocity principle is effective. We feel that we must return concessions or favors that we’ve been provided with by others. People who receive a free gift or a free sample are more likely to return the favor, one way not another. This is why it’s effective to offer free samples. It doesn’t even have to necessarily be a physical good, as this principle works just as well with information and favors, too. According to this principle, people tend to make choices similar to the ones made by people they like. Liking someone is a meaningful thing, because it implies that you have some of your characteristics are in common with that person. Liking can go deep, like having the same beliefs, and it can also be shallow, entirely based on looks. This can be related to people’s inner need of control and recognition. By selecting people and things we like, we are trying to show other people that we’re here too and that we are not worse, than them. And it works with clients. The more you understand their preferences, the more you are able to create an image they will be drawn to and, thus, will be more likely to have a positive reaction to it. This principle implies that people have a deep necessity in being perceived as consistent. Therefore, if we commit to something in public, we are much more probable to stick to choice related to that commitment further on. Psychologically, this is explained by the simple fact that people consider this commitment same as important as their self-image. From a psychological perspective, this is explained by the fact that people have established that commitment as being in line with their self-image. We will never share your data. Trusted by SMBs and Fortune 500s across the globe.